Cocoon style 1331 Open Breast Waist Cincher Girdle Corset. This girdle sculpts and enhances the feminine form by lifting your bust, compressing you abdominal area and providing support to promote correct posture. The immediate results of wearing this garment will help bring out your hourglass form. The internal boning design prevents roll up while the high U back design offers additional back support. Adjustable shoulder straps with an open breast area so you can wear it with your favorite bra. Two rows of Hook and Eye front closure provide adjustments as you require a tighter fit. 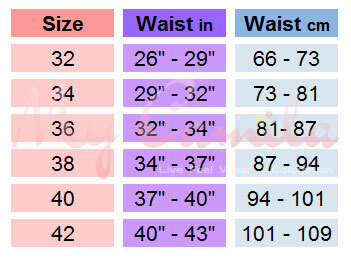 This waist cincher provides strong compression in your abdominal area. The inner cotton layer contains seaweed micro capsules. Theses micro capsules will revitalize and hydrate your skin. The Rubberflex layer covers all around the abdominal and waist area generating a thermal reaction that is a key component in helping transform your body, by promoting the removal of toxins through perspiration. It also increases the strength of the garment allowing you to wear it on a daily basis.